A long cycle rule prevents infinite games. A board position is defined by the colouring of the grid’s intersections directly after play and any consequent removals. 1. If between the two occurrences the difference in number of captured black and white stones is not zero, then the program that captured the most stones of the opposing colour wins the game. 2. If between the two occurrences the difference in number of captured black and white stones is zero, then the game ends as a draw. Patrick Traill: I do not see it stated that repetition in a basic ko is forbidden, but I presume that is the case? The Computer Olympiad Rules further uses area scoring are scoring rule. Notice that in this case it is a positional rule, It doesn't matter which player's move it is. An example of this rule is in the Sending two, returning one position. After ( at ) Black loses. The (full board) position is recreated. 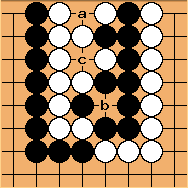 And because in the cycle more Black (two) than White (one) stones are captured, White wins. Black is therefore a mistake; to compensate Black should play a ko threat elsewhere before recapturing at the marked point. This is a triple ko, you have the kos a, b and c. If Black takes a, White takes b, Black takes c, White can than retake a, Black can retake b and White can retake c, and the original position is recreated. In this cycle, Both Black and White have captured an equal number of stones (three) so the result under the long cycle rule is a draw. In this example the player who recreates the position wins. at recreates the position and because white has captured more stones than Black (two versus one), she wins. Under positional or situational superko rule would be an illegal move, and would gain a point. White's pass was a mistake. Under the long cycle rule should simply pass. If two consecutive passes end the game, then the position is this. The marked point is shared, and Black wins by 1 point. willemien When I first saw these rules I liked the rule, but now (April 2009) i am wondering about them. Not only about the positional nature (I would prefer an situational variant) but also is it good to have an separate scoring rule for cycles? Is it not better just to declare one move illegal, and let the game continue instead of ending the game? Erik: Computer Olympiad rules were designed for computers! In general there is no sane way to continue play after a long cycle repetition occurs simply because the programs may not be altered during a game. Also, programs cannot use the excuse of 'not knowing the rules'. Erik: For friendly human games you could of course try to be more relaxed (e.g., give the option to play another move after explaining the exceptional result, or effectuating the exceptional result only on the n-th repetition). However, for official games it is perfectly reasonable to assume that making an illegal move forfeits the game. Willemien You misunderstood me or the rule. it is not illegal under this rule to recreate a board position. It is just that when it occurs the game ends and is scored by using a different scorings mechanism. It is not (by definition) the case that a player who recreates a position loses. Erik: I know, I wrote these rules. I just want to point out that directly assigning an exceptional score is in some sense equivalent to declaring a move in the (unbalanced) cycle illegal. In a long cycle many moves are played; since both sides contribute to the cycle, the question arises where to assign blame (for attempting to force an infinite game) and who should receive the punishment (if any). BTW In early drafts the rule was situational, but Robert Jasiek convinced me that for all practical purposes the positional form is acceptable and of course results in a simpler formulation. Erik: Since Black 3 in your send-2-return-1 example leads to a direct loss any other move or pass must be better. How is that so different from declaring it illegal (as done by standard PSK)? If you make an illegal move in an official game then you lose. As far as I can see if a player can force a long cycle win it can only happen because his stubborn opponent provided him with that option by not passing, or playing elsewhere, when he had the chance. Willemien: I found an example (example 3, my text above is slightly altered) where the player who plays last and recreates the position wins. and all moves of this player are among the best for this player. Erik: In my opinion your example 3 is nothing special; just the same sent-2-return-1 where it is again Black who is punished for attempting to prevent a normal game-end. The only difference is that you started from another position in the (unbalanced) cycle. Black's self-atari is simply a mistake (just as it was in your first example). Erik: Sure, the only thing we need from our ko/long-cycle rules is to prevent infinite games. The decision is usually not difficult either. Passing conveys the message that a player believes the game is over and can be brought to a normal game-end (starting the counting procedure). If his opponent then, instead of also passing, starts a long cycle he is trivially identified as the abuser. It is also directly apparent from analyzing the number of captures in each cycle simply because any non-pass becomes a capture. Willemien: About example 3, I think that under superko rules the self atari at is the best move, not a mistake (because White cannot capture, there is nothing to worry about, and it is the only move that increases Blacks score) Under superko rules pass is not optimal ( at is better) but under the long cycle rule it is the best one. RobertJasiek: A pass does not say "I believe that the game is over." but says "If the sufficient number of successive passes are now being made, then I want the game to end.". - "abuser" is a moral term; this is inappropriate; rules application is a matter of legality - not of morals. - It is an interesting idea though to design restriction rules that prohibit something for the player playing first after a pass. This has not been fully studied yet but is deserve some study. - Under superko, what occurs is not "rules-anomalies" but "terminal shape anomalies". They are fun. It is also possible to prevent them by means of the rules: "Three successive passes end the game. A player may not make the final pass if an opposing string is on atari." One can go further and prevent the anomaly of ordinary sekis: "A player may not pass unless there are only two-eye-formations on the board." Very free of anomalies! Why o why aren't rules that straightforward?! :) The question is: Which types of anomalies shall there be? Clearly sekis are the abundance in terms of frequency! Erik: I do not agree. Morality provides grounding for proper behavior in any social context. I see no reason to exclude games. The term abuser perfectly suited the message I wanted to convey. You focus on application of rules; I focus on the rules themselves. Regarding your "terminal shape anomalies": how can a shape be terminal if the game does not end with that shape? Why do you bring up seki? Is there any reason to believe that seki needs special treatment? Does seki cause infinite games? RobertJasiek: Morality is for human rights or tournament rules but not for rules of play. - I focus on the rules themselves as well. - Simply speaking, a terminal shape is a shape occurring at the game end. This answers your question. - I bring up sekis because they are an anomaly if occurring as terminal shapes. - Sekis need special treatment if it is your aim to treat anomalies specifically: You might have to make an exception to exclude this anomaly. - Some sekis cause infinite games: see, e.g., double ko sekis. But the question is not whether they do but which anomalies you want to exclude and which not. Herman: Why is morality for tournament rules, but not for rules of play? One can certainly design a rule set so that certain "on the board" behavior that is considered immoral would be punished. RobertJasiek: The function of rules of play is to define the game. A function of tournament rules is to handle human behaviour. - It is possible to mix up the two but it serves no good purpose. E.g., cycle is not defined by better or worse moral behaviour. Erik: Robert, is it your opinion that morality should not play a role in comparing rulesets either? To me it seems reasonable to compare possible behaviors under different rule designs and state a preference for or against certain behaviors. Of course, if a ruleset has been designed with care and all relevant moral considerations are in some sense encoded in that ruleset, then morality becomes superfluous for the *application* of that particular ruleset. As for the "terminal shape anomalies"; I do not see that as an adequate substitute for "rules-anomalies" because (1) not all anomalies that can occur under superko are necessarily present in the final (terminal) position, and (2) the scope of the word "shape" seems to be too narrow. Also, I still see no reason for sekis to get special treatment; in this context I don't even see the need to define what seki is. RobertJasiek: Rules of play are not about morality so that is a wrong measure for comparing rulesets. - It is possible to compare strategic (not: moral) behaviour of application of different rulesets of rules of play. It is possible to state preferences. But what is the purpose of such statements? Quality of rules is not compared by polls. What matters is objective reasons because they can be verified and therefore convince many people. - Anomalies: So you want to consider all, not just terminal. You do not want to identify them only by shape. You do not want to include sekis in your list of anomalies. So what in general do call an anomaly? And why only this? And how do you define them for rulesets you do not know yet? How can you choose a good ruleset since you do not choose but start with the rulesets and only then observe their behaviour? Erik: When discussing differences in potential behaviors under different rulesets I find it convenient and natural to use moral terms. This does not mean that such terms cannot be objectified. In fact, I'm certain that everything I said can be objectified, but I simply have no intention of doing so here and now. Robert, I feel most people understood exactly what I meant. I'm sorry, but I simply don't have the time to explain everything to you. RobertJasiek: The core questions remain though: What in general is versus is not a forced cycle? Erik: Something is forced if there is no alternative. To clarify: A cycle with pass cannot be forced for both sides because it contains a moment where the game can be ended with consecutive passes. Once in a cycle, the absence of pass generally indicates that both sides are forced (assuming they play rationally). In exceptional cases there may also be an alternative at the moment just before the cycle starts (but for simplicity we can probably discard that here). RobertJasiek: Your description of forced is pretty good on an informal level. On a formal level, we need the formal concept. However, what we really want to know is the consequences on practical shapes / behavioural cycle classes so that we know in which of them a cycle is forced and in which not. - Your statement that a cycle with pass cannot be forced for both sides and the same conceptual idea conveyed by the Spight Ko Rules is very interesting. It deserves a precise formulation of presuppositions (under some constructions of multiple successive pass rules, things are not so simple as you guess) and then a mathematical proof of a carefully formulated proposition. Very important. One of the proofs I would like to make next when having time for more ko rules research. Thanks for the motivation! - "Once in a cycle, the absence of pass generally indicates that both sides are forced." Hm, if we recall typical shapes, we are pushed into that belief. But I prefer to remain sceptical until there is a proof. - Can you give an example to illustrate exceptional cases with a (good!) alternative just before the cycle starts, please? Erik: What I had in mind were the quadruple ko and round-robin ko examples in the Chinese rules. In these positions, at least before cycle starts, the first player could pass and aim at an ordinary seki. However, once this player decides to play (aiming at an infinite game) there may be no option for his opponent to pass any more (so it becomes more difficult to observe that only one side is forced). The Chinese rules use the statement "if neither side will yield". But what if one side is willing to yield (if he would play first he would simply pass) but simply does not get the option? RobertJasiek: What in general shall versus shan't be an anomaly? I have understood that you want to make distinctions here but you have not explained clearly where. Erik: Consider a situation where the game-theoretic value can be inferred using generally accepted (basic) rules alone. Then we add (or modify) a rule. If this changes the game-theoretic value then I consider it to be an anomaly. Bill: I have basically the same philosophy. However, one place that we may differ is that I consider the game-theoretic value to be independent of who has sente. RobertJasiek: Generally accepted basic rules alone - would that be the Default Restriction Rules, i.e., 1) a board-play succeeding a board-play may not recreate the position, 2) alternation ends with a succession of three passes (not because 3 would be generally accepted but because the behaviour then would be since more anomalies can be dissolved), 3) also a cycle ends the alternation? How to define "the" game-theoretic value then? I have shown how to define basic ko types then, but values is more Bill's field. - With "adding a rule" you would be meaning to add more restrictions that those of the Default Restriction Rules (like ending after already 2 instead of 3 successive passes). - Your approach to then study the occurrence of differences compared to the default is interesting. Not as general as my approach via meta-principles might have been but still pretty general. The key issue is though which default rules we should be accepting. Are my Default Restriction Rules the best choice for that purpose? - Bill, with or without sente are both interesting study objectives. It depends on one's aims which to use. Bill: If a position has a score, then the score should remain the same under perfect play, regardless of who plays first. As for anomalies, they are to some extent in the eye of the beholder -- to some extent not, because there are positions that nobody thinks are anomalous. One guide is the number of conditions that you put on evaluation. If the score depends upon whose move it is, then in some sense the concept of the score is less basic than one that does not depend upon that. The same is true if the score depends upon a ko or superko ban. Also, it may depend upon the type of ban. RobertJasiek: Do you mean the score of the position if it would be the final position or the score of the position after perfect play (in which case the score depends on perfect play)? Bill: Consider a simple ko. With no ko ban, perfect local play is an infinite loop. To avoid that, we make a ko ban rule. As you know, we have two choices. The simplest one, in a way, is to make all kos disturbing kos. Once you have repeated a position, you cannot make the same play from that position that you did before. If we define a play by the whole board positions before and after the play, you can't repeat a board play. The other one is to make it a fighting ko. You can't take the ko back. This rule leads to ko fights. These different ko bans affect the value of the ko position. There is no way around that. Note that there is a kind of trade-off in terms of simplicity. The simplest concept (disturbing ko, with no ko fights) does not have the simplest rule (no take-back, which leads to ko fights). Simple rules have a tendency to lead to anomalous positions, i. e., ones that are hard to describe and conceptualize. RobertJasiek: I am not sure which new infinite loops you are referring to. Please give an example. Bill: Double ko seki, sending two returning one. Both are disturbing kos made possible by lifting a ko ban by passing. RobertJasiek: There is no abuse of rules of play if only they are complete and logical. There is only application. If something might be perceived as wrong, then it is buried deeper in the bad rules design. The responsibility then is one of the rules writers - not the players. - Meanings of a pass are not moral questions. Moral questions are whether one should like certain meanings of a pass. - A pass is a right unless a rule restricts it. In particular, if the rules say "A move is either a play or pass. The players alternate moves. ", then pass is a right. Always. (Until the game end.) - An abuser in a repeating position does not exist but an attacker. Bill: This Black group is dead under Japanese, Chinese, Korean, and Ing rules. But under the long cycle rule, doesn't it either live or cause a draw by triple ko? White tries to capture the Black group, starting with . now takes the double ko as a local ko threat. After takes the ko back, White cannot pass, or Black will pass, ending play with the Black stones alive. So White continues the triple ko with . repeats the whole board position, ending play under the long cycle rule. Each player has captured 3 stones in the cycle, so the result is a draw. RobertJasiek: Same if Black exchanges captures before he passes and White attacks. 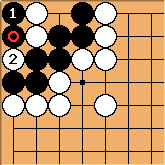 - The shape is an anomaly under Japanese, Chinese, Korean, and Ing rules and the rules texts make this pretty clear. Therefore comparison to these kinds of rulesets is of little interest. Arguing that what professionals have considered by exceptional rules should not be an anomaly for that very reason would be very stupid because a) the shapes are rare, b) even much rarer shapes are mentioned there, c) the related rules are extremely ugly. - It is more interesting to compare with the behaviour under Default Restriction Rules: Either player can, if he likes, force a cycle, and this ends the alternation. (Black can force the double-ko-seki-pass-pass-cycle.) Neither player can improve the score by capturing stones. - This behaviour occurs also under the Long Cycle Rules. The same can be said about Japanese, Chinese, Korean, and Ing rules but now the exceptional rules of the Japanese, Chinese, Korean, and Ing rules intervene and create an abnormal behaviour in the abnormal shape: For no good reason, they declare Black dead so that his stones will be removed, etc. The "no good reason" is: Those traditional rulesets' authors see a solid white eye while Black has none. Or they see one internal white liberty, one external black liberty, and two "shared" liberties and make the arbitrary invention that an internal liberty would be worth more than an external liberty. Such thinking comes from the imagination that White could capture and fill the external ko (moving twice in a row) while Black cannot start by filling the internal solid eye liberty. Arbitrary anomaly ruling for the sake of it. By the same reasoning, one could dissolve also Hane-seki in favour of the opponent of the player having the external hane-1-liberty string. Stupid inconsistency! Not to mention that under other circumstances the same rules authors presumed the Default Restrictions Rules implicitly. - My WMSG external ko definition provides much better reasoning, but I need to verify how it does apply to this example. Jozsef: I don't think this position really differs from moonshine life, so the same treatment seems appropriate. If one takes the trouble to recognize draw on repetition, unbalanced cycles are not the only thing to look out for. IMO the important thing is that in these cases one player can initiate an endless capture attempt (and can suspend anytime - eg. to delay it until after the first gamestop), while the other can do nothing (besides disturbing once). While treating them like normal repetition doesn't seem so horrible either, I think there is some good logic behind the human tradition in these cases - however weird Japanese and Chinese rules may be. RobertJasiek: Jozsef, triple-ko-with-one-external-ko, moonshine-life, and double-ko-seki are pretty similar under the Default Restriction Rules indeed. In particular, e.g., the Long Cycle Rules produce the same behaviour. - Once more: Whether the other player "can do nothing" depends on the given rules! It does not depend on the shape alone! So if you want to argue "can do nothing", then before you had to presume some class of restrictions rules so as to create this conclusion under these circumstances. Prejudiced assumptions produce prejudiced behaviour! - What would be the "good logic" behind human (current professional) tradition? This "good logic" 1) presumes Default Restriction Rules but overrides their presupposition for the sake of creating exceptions, 2) pretends that one solid eye beats no eye while every child knows that no eye can beat one eye in a semeai, 3) perceives external versus internal while not having been able to define the difference (it has been me last year to provide a first partial description of it), 4) pretends greater strategic variety for one player than for the other player without first declaring the presumed rules clearly, 5) arbitrarily values solid-eye-shape liberties higher than basic-ko-shape liberties, 6) etc. I see only very bad "reasoning", i.e., the opposite of good logic. Tell me where the good of the "good logic" of current professional tradition is! I'd rather say that it is the epitome of the opposite. Not just a total failure but devised deliberately to make deciphering as hard as anyhow possible. "Depends on the rules" - IMO this is only partially true. As long as you talk about go, the well known game, you need to honor some fundamentals. It can also be interesting to presume some special rules and see what happens in given positions, but this is secondary, and doesn't invalidate the fact that in normal go, there is a unique one-sided-forceable nature of the moonshine positions. RobertJasiek: Moonshine life is rather not "normal go" but an anomaly, especially some having seen different rulings at different times. - What are "the well known fundamentals"? It depends on whether, e.g., you allow superko to kill two-eye-formations. The don't care for terminal positions approach by some Westerners sees Go as "two players, alternate, capture rule, restrict infinite games by some rule that works in general". The Asian professional approach sees Go as "terminal positions may be a) independent-life, b) seki without ko, c) we do not know how to handle kos". So what IYO are those "some fundamentals" - as seen by the Asian pros - WRT to kos?! I see only one clear thing here: Currently present dead basic kos (unless we have multiple kos) in territories shall fall under (a). Otherwise identification of professional opinion is pretty much guesswork. E.g., already triple ko is not general. E.g., double-ko-seki has never been described carefully by professionals.